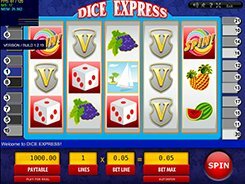 Having a simple look and a 5-reel 21-payline configuration, Dice Express provides an experience that is similar to playing classic three-reel slots. The symbols you will encounter on the reels are of a classic design and include lemons, cherries, pineapples, plums, watermelons, cocktail glasses, and other themed symbols. 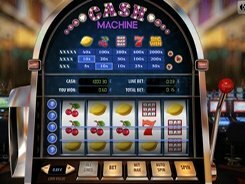 Along with the regular fruit symbols, the slot features four special icons, namely, a wild, a scatter and a couple of bonus icons that trigger two bonus games. By changing a line bet from $0.1 to $5, you may place a stake anywhere from $0.1 to $105 per spin. 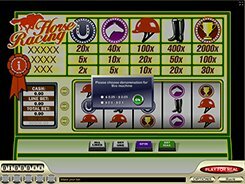 The largest fixed jackpot worth $50,000 (on the maximum bet) is awarded if you hit five wild symbols on an enabled payline. The Spin symbol activates the Wheel of Fortune bonus game. Once started, you are taken to the second screen that shows a wheel split into sections along its edge. You get 9 bonus spins that may bring you big multipliers that are applied to your line bet in the triggering main game. Another bonus game is activated by five Dice symbols – you will have to roll dice that may add some good cash to your bankroll. PLAY FOR REAL MONEY!